What went wrong with Orange? I think there is something wrong with the content. When I made Bommarillu, all my friends were in love. After few years, they got married. All these people who were so good when in love got so many differences after they got married to their loves ones. Why do we act and tell lies to wives (and vice versa). Why can’t we be ourselves in a marriage? We have decided to shoot the film in Australia. I wanted to show something that justifies the abroad shoot. I read about the art of graffiti in net. Graffiti is about freedom and short-term attachment. If we do a painting, we preserve it and are emotionally attached. If we do graffiti, we forget after doing it and leave it to the public. The hero characterization and graffiti work has some connection. I was pretty much excited when I wrote the film and started it. But things have got lost in translation. I failed in balancing the points of views of both hero and heroine. I ended up being biased with boy’s point of view. It was a painstaking process to write Orange script. You don’t find any reference points. I have never seen an ideal couple so far and realize that we have to get on and be satisfied with both good and bad traits of our partners. I had pain in brain while working and thinking about Orange. I went to Apollo ad the doctor said that it was a simple headache. But I said that it’s not a simple headache. She checked it again and said that it’s due to restlessness. She has asked me to take rest for 10 days without thinking anything and gave me sedatives. I was stressed so much psychologically while working for Orange. At a personal level, Orange film has changed my life. I started sharing everything with my wife irrespective of how unpleasant it is. Tell me about your marriage? I was getting too many accolades from all when Bommarillu was released. I wanted to take off sometime so that I don’t get affected by the praise. We (me and Vasu Varma) went to Vizag on a holiday. In one of the functions I met my wife who is a family friend to Vizag distributor Kranthi Reddy. Our friendship developed into love and we married after 9 month (just before the release of Parugu). Tell us about Ongole Githa? I just like I didn’t get affected by Bommarillu success, I was deterred by the failure of Orange. I have written another love story, but felt that I should get out of love story mode. For a difference I wanted to create a villain character. Initially I was drawn by the villain character. Then created the backdrop of a Mirchi yard. I have committed a film for BVSN Prasad after the release of Bommarillu and he liked the story idea of Ongole Githa. This film is not a formula film. Once we have decided to cast Ram, I have done a few changes to the character of hero to incorporate the energy of Ram. Ongole Githa will have simple and entertaining content. Ram is a delightful actor. It’s easy to handle Ram as he delivers it immediately. He is an excellent actor with a high caliber. What do you think are selling points of Ongole Githa? 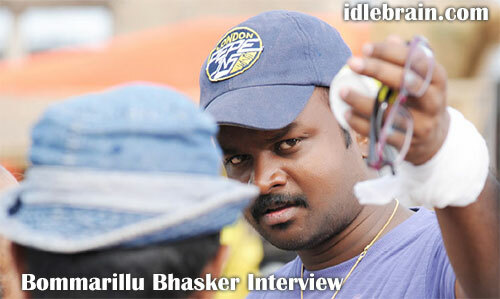 How come a class director like Bommarillu Bhaskar has done a mass film? You might get that feeling due to Ongole Githa title. I didn’t leave my sensibilities while directing Ongole Githa. Prakash Raj said that the texture and layers of my films is there in Ongole Githa as well. I have a dream project which I had written 11 years back. I wanted it as my debut film. I might do that as my next film. There are a couple of other scripts too. I will make an announcement soon regarding the same.